A single-core ARM Cortex-M4F processor with hardware support for single-precision floating point operations and a maximum clock frequency of 72 MHz. A variety of integrated peripherals such as timers, I2C, SPI and USART. General purpose Input Output (GPIO) and other types of pins accessible through the two rows of headers along side the board. A USB interface accessible through the USB port labeled "USB USER". An accelerometer as part of the LSM303DLHC chip. A magnetometer as part of the LSM303DLHC chip. A gyroscope as part of the L3GD20 chip. 8 user LEDs arranged in the shape of a compass. 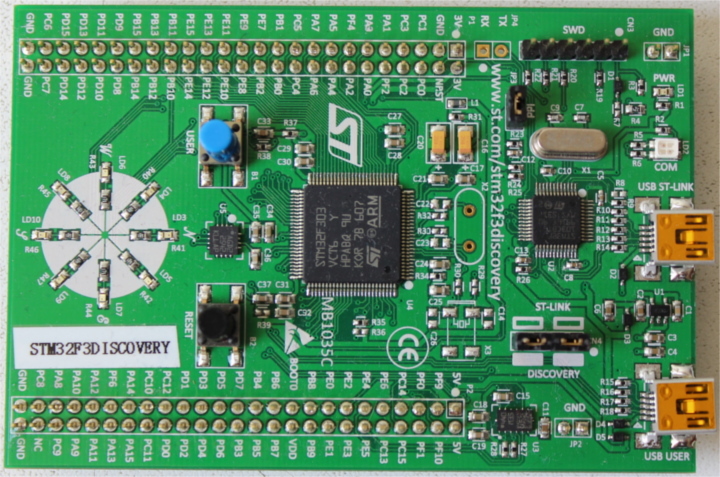 A second microcontroller: a STM32F103. This microcontroller is actually part of an on-board programmer / debugger and is connected to the USB port named "USB ST-LINK". For a more detailed list of features and further specifications of the board take a look at the STMicroelectronics website.